On Wednesday the University Board gathered for its first meeting of the autumn semester. As tradition dictates, we met in the University Main Building, where the meeting in the new University Board Room began with the Vice-Chancellor’s report (PPT). The presentation met with lively interest, and as Vice-Chancellor I was pleased to be able to say that we had welcomed 9,500 new students, that the number of international students is increasing, that our researchers are successful and that we are engaging in new initiatives, such as the European University Network. If you follow this blog, you will already have read about many of these things. The next point on the agenda was the half-yearly financial report. Director of Planning Daniel Gillberg presented the forecast for 2018, which confirmed that things are going very well for Uppsala University. The number of full-time equivalent students continues to increase and will exceed 24,000 this year. The financial situation is stable. The deficit in 2018 means that the University is using accumulated agency capital, as planned. The total number of full-time equivalent employees at Uppsala University has been fairly stable over the last few years. In the first half of 2018, the total number of FTE employees increased slightly to 6,042, up from 5,960 last year. Among research and teaching staff, the main growth has come in career-development positions, but the number of professors, senior lecturers and lecturers has also increased. The number of researchers and doctoral students, on the other hand, has gone down. One of the University Board’s most pleasant tasks is to award prizes. This time we had the pleasure of deciding on the winner of the Björkén Prize. This very prestigious award was established in 1902. Several future Nobel Laureates have received the prize, including Kai Siegbahn and Arvid Carlsson. The prize winner is nominated by a prize committee that includes the Dean of the Physics Section, Jan-Erik Rubensson. He attended the meeting and presented the nomination to the University Board. The prize will be presented at the Winter Conferment Ceremony. The point on the agenda that generated most interest, even before the meeting, was the review of the rules of procedure and the procedure for nominating a new vice-chancellor. The background is as follows. At the University Board meeting in December 2016, the Vice-Chancellor received a mandate to conduct a review of the University’s rules of procedure in 2017. The review committee delivered its report and proposal on the revision of the rules of procedure in October 2017. At the University Board meeting in November 2017, the Board decided to appoint a sub-committee of the Board to further elaborate the review committee’s proposal for new rules of procedure. An interim paper on Uppsala University’s rules of procedure will be distributed in the University for consultation. The interim paper concerns the procedure for nominating a vice-chancellor (appointed by the government) and a deputy vice-chancellor (appointed by the University Board). This has not previously been included in the rules of procedure. The interim paper also contains a proposal on terms of office for senior university officers. The Chair of the University Board, Gudmund Hernes, emphasised that it is important to allow the internal discussion to take time, and to give everyone a chance to say what they think, so that the proposal is firmly anchored in the University. In connection with its ordinary meetings, the University Board often takes up important strategic issues. The topic discussed on Wednesday was fundraising, which is a prioritised area for the University. In the course of the past year, the Management Council and disciplinary domains have worked on this issue in a more focused and systematic way than before. Agneta Stålhandske from the Development Office described ongoing developments and progress in the area. On the proposal of the Chair, Gudmund Hernes, a new point has been introduced at University Board meetings – a researcher presentation. The first researcher to present his work was Professor Thomas Schön from the Department of Information Technology, who gave a mini-lecture entitled “Machine learning provides the backbone algorithms enabling AI”. Gudmund and I believe it is important that the University Board obtains a deeper view of the research being carried out at the University. We wrapped up a good and inspiring meeting by noting that the next time the University Board meets will be for an overnight conference in November, when we will discuss the University’s Mission and Core Values. I look forward to that. This week we have also had a visit from Hallym University. 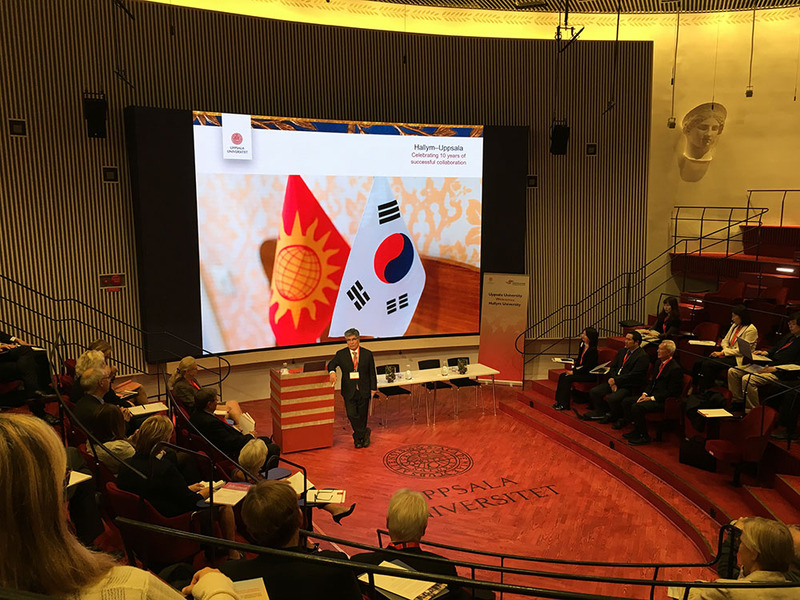 Our partnership, which celebrated its tenth anniversary this year, began one icy winter a decade ago when a delegation from South Korea came to Uppsala. The delegation had come to discuss cooperation in the medical field and a decision was soon reached to hold annual symposia alternately in Sweden and in South Korea. Since then these symposia have served as a platform at which colleagues from the two universities have discussed new research findings and discoveries in medicine. The universities decide jointly on the topic of each symposium. This year’s topic was “Health and Disease in Women and Children” – a choice representing successful research environments with ambitions to become even better. The partnership is one example of our commitment to internationalisation and Uppsala University has previously welcomed visiting researchers from Hallym in areas such as neurosciences and clinical immunology. One possibility currently under discussion is to send one of our cancer researchers to South Korea, and we are also talking about arrangements for potential student and teacher exchanges. This is a partnership that will certainly grow as time goes on. We have developed a close relationship over the past decade and we were particularly pleased that Dai-Won Yoon, Chairman of Hallym University, was among the visitors this time. He was the main force on the South Korean side in 2008, presenting a plan for the scholarly exchange and noting the great potential. Many today are glad that he did so.